On this weeks podcast, we invited Rebecca Sudore to talk about the results of her PREPARE randomized trial that was published in JAMA Internal Medicine this week. The trial enrolled nearly 1,000 English and Spanish speaking older adults being cared for in a public hospital. 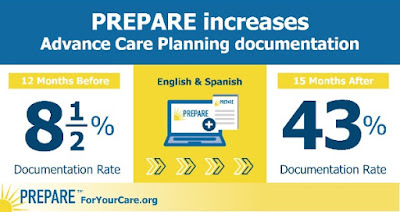 The headline results showed that after reviewing the PREPARE For Your Care online program and the easy-to-read advance directive, 98% of older adults reported increased engagement in advance care planning (ACP) and 43% had new ACP documentation in their medical record. Even more good news, PREPARE worked equally well among English and Spanish-speakers and across health literacy levels. Want even more of the GeriPal podcast? Watch the video of today's podcast below! Eric: Alex, I see somebody else is in the room with us today. Alex: Today, we have a repeat guest. She's waiving for the camera. We're on YouTube again. Hello everybody. Alex: We have Rebecca Sudore, who's a professor of medicine here in the division of geriatrics at UCSF. She's going to come talk to us today about another PREPARE trial, this time in Español. Eric: We're going to do all about advance care planning. But before we do that, Rebecca, we ask all of our guest, do you have a song for Alex? Alex: I've heard from your team that they wanted a song in Spanish, right? Alex: Gracias a la vida. This is in Spanish. I did take some Spanish at some point. Rebecca: Yay! That was great. Eric: I'm guessing there is a reason we're doing something in Spanish today, and I think that reason ... Rebecca, you have an article that was just published. Is that right? Rebecca: That's right. It's very exciting. Eric: On your PREPARE for Your Care website and advanced care planning. I'm hoping that we can chat a little bit about that. Before that, I'm wondering if we can take some big steps back as really a national, international expert on advanced care planning. I quite haven't figured out exactly when we talk about advanced care planning, what are we actually talking about when we mentioned those three words together? Rebecca: Yeah. It's very interesting, because I think that the definition has evolved overtime. I think when I started this work, advance care planning, really meant only one thing. Did you complete an advanced directive, and specifically did you complete one of the check boxes about CPR or mechanical ventilation? I think to this day, people still think of advance care planning as only that very small thing. Terri Fried and I in 2010 in Annals of Internal Medicine published this paper called Redefining the "Planning" in Advance Care Planning, which we really took a step back to try to broaden that definition, because advance care planning actually is many things. It's thinking about what is most important to you. It's trying to identify your wishes and how you want to live your life and what brings your life meaning. Then communicating that to other people, either by having discussions or for some people documenting them. So again, advance care planning is very broad. Alex: So it's not just if your heart were to stop, would you like us to restart it with electricity? Rebecca: Much broader than that. Alex: Much broader than that. Alex: It's more than having a living well durable power of attorney? Rebecca: Exactly. It's a part of it, and I think as we were talking earlier, when we think about the field of palliative care, hospice is a part of that, but it isn't all of it when you think about Venn diagrams. Those advance directives are a part of a much larger, broader process. Alex: Right. When we're thinking about advance care planning, you've said the word process. It sounds like that's a key part of it. This isn't a one-time thing. We had the discussion, we're done. Could you say more about that? Rebecca: Yeah. Terri Fried has done a lot of work thinking about readiness and things like that for people who are ready to engage in advance care planning, and I think we found the same thing just like for, say, smoking cessation, or getting engaged in an exercise program. People think about things for a while. They prepare and then they're actually ready for action, and it's the same thing with advance care planning. I like to think about the idea that you're not just going to hit the double diamond, like run on your first time on a set of skis. It's the same thing with advance care planning. You need some help and some preparation, which is what our prepareforyourcare.org website does and that it helps people wherever they are to jump in to that process. Alex: We had you on this podcast ... I don't know, a year ago? Something like that? About a year ago? Alex: Where we talked about your first PREPARE trial. Could you remind folks whom astoundingly may not have listened to or read that podcast or read the article, what you did there? Rebecca: Yeah. That was a really exciting trial for us as well. We actually conducted that trial in the VA. It was a randomized trial and it was a comparative efficacy trial, meaning everybody got some form of advance care planning. One group got our easy-to-read advance directives. We haven't really talked about that, but they're written in a fifth grade reading level. They're easy to read. The other group got that advance directive, but also PREPARE. Then we followed people for six months and we wanted to know what would happen. We found in that trial ... By the way, the thing that was important about that trial is it was patient-facing only. Meaning, we gave people these tools and we wanted to know how much bang for our buck could we get by just giving stuff to people? We didn't do any interventions with clinicians, or the healthcare system, and we found that six months later people really engaged in advance care planning and we're able to do a lot of these stuff on their own. Surprisingly, people in the PREPARE arm actually had evidence of documentation of advance care planning in the medical record, like 35% of them did. With the easy-to-read advance directive, 25% of them did. Again, that's just documentation. Again, many people were engaging and having conversations and thinking about their values and wishes. So that was an exciting study for us. Alex: We're done! The shortest podcast ever. Recap of prior podcast. Back to the ... No? Eric: No. End us with a song, Alex. Rebecca: Well, there are many different types of people in the world besides veterans. Much of the work that I have done over the last 15 years have really been in disenfranchised populations and thinking about how can we reach people who might not have access to normal regular access to medical care, much less medical education and materials. We know historically people who say are in county facilities or county hospitals and have lower health literacy, or who don't speak English as a primary language, have really low advance care planning rates. Really, that's because there haven't been materials that have been made with co-creation with them and for them. The VA study was really exciting to us, but we knew we needed to go the next route and really see could these materials, again, that were created with and for people at our county hospital, could they actually work? We had translated, we had gotten funding to translate, PREPARE into Spanish, but it hadn't been tested in that population yet. Alex: When you say translated into Spanish, do you mean you did voiceovers in Spanish? What does that mean? Rebecca: We didn't use Google Translate, no. It was actually a very long arduous process. I like to tell this story about how even the word advance directive means ... There's many different words in many different Spanish speaking countries. Even to come up with a word that would make sense on the website, it just took a long time. It wasn't a straight translation. There was a lot of cultural adaptation that had to take place in the wording and things like that. We really wanted funding to be able to re-shoot all of the videos, but we didn't have funding to do that. It is audio dubbing, but all of that from every single word on every single page and every ... We haven't talked about this either, but PREPARE is really video-heavy. That shows people how to do advance care planning. All of that had to be recreated essentially for Spanish. Alex: Wow! That sounds like an enormous undertaking. Do you want to acknowledge any funders before we move on, continue? Rebecca: Yeah. There are a lot of them. There was the National Palliative Care Research Center. There was the PCORI, also did that. There was the John and Wauna Harman Foundation, Gordon and Betty Moore Foundation, the Bechtel Foundation, Tideswell, lots of groups. Alex: Yeah, lots of groups contributed to this. It's great. Eric: Okay. Really important. It sounds like that in safety net hospitals, hospital with large Hispanic population, that this is often an issue, where they're not getting the advanced care planning. What did you do in this study? It was at the same exact design as the previous one, randomized control comparative effectiveness study? Rebecca: Yes, it was the same setup. One group got our easy-to-read advance directive either in English or Spanish, and the other group got the easy to read advance directive plus PREPARE in English or Spanish. Eric: So there is no usual control where they didn't get either one of those? Rebecca: No. I think because studies have shown that advance care planning really can help people, we didn't feel like it was ethical to have a control group. Alex: When you say people, are we talking older adults here? People with serious medical illnesses, chronic conditions? Who was in that study? Rebecca: Yeah. Often times in county populations, again, because of decreased access, there's accelerated aging. We actually, instead of starting at 65, we actually identified people who are 55 years of age and older, had two or more chronic or serious medical conditions and had seen their primary care provider twice in the last year. So we knew they were plugged into care. That was our patient population. Alex: Did you exclude people who had baseline already had engaged in advanced care planning? Rebecca: That's a really good question. I think the reason that we didn't is because a lot of the pilot work that we showed, that even people who had engaged in advanced care planning or thought they had engaged in advanced care planning, they learned things with PREPARE or the easy-to-read advance directive where they realized, "Oh, wait a minute, I made the wrong decision," or "Wow! I started this process, but I actually never talked to anybody about it," or "I completed this advanced directive, but it's sitting somewhere in the back of my file cabinet." We actually didn't exclude anyone who reported that they had done this before. Alex: Yeah. We should talk a little bit about what this intervention was now that we've talked about who was studied. Can you say more about what PREPARE is? What do you do? How do you access it? What are the outputs? Rebecca: Yes. I'll just say first that we created these easy-to-read advanced directives, and as you were saying, just like the VA trial, we thought we were done. But we heard from patients and their families, they really needed help learning the skills so that they could identify what is important to them and be able to talk to people. It's a tall order to sit in my geriatrics clinic and tell somebody to go out and choose a surrogate decision maker, but how do you do that? How do you start that conversation, and people felt like that's what they were missing. That's really what PREPARE is. It's a five-step walkthrough program that really teaches people skills so that they can identify what's important to them and express those to other people. That's what it does. Like I said, it's five steps. You don't have to do all five steps. We asked people in the trial to do all five steps, but in real-life, you don't have to. It's free. It's available at prepareforyourcare.org, as are the easy-to-read advance directives. It's been available to the public since 2013. Eric: Where do they do this Prepare for Your Care? Rebecca: You can do Prepare for Your Care anywhere you want. You can do it on your phone. You can do it on a tablet. You can do it on a desktop. You can do it at home. You can do it in a group medical visit. You can do it in a clinic. Eric: Where did they do it in your trial in this most recent one? Rebecca: Aha. Yes. The difference is when you do your first set of studies, often times people will do what's called an efficacy trial, which is the best possible research conditions, versus messy real-world effectiveness, what they call it. We're doing effectiveness right now, but that trial was efficacy. Meaning, we asked people to come into research offices. We showed them PREPARE. We asked them to go through the five steps. Our study team was available to answer questions, but they basically said, "I'm doing work over here. Let me know if you have any questions," and try to simulate as if they were doing it at home. But they did come into research offices. Alex: Got it. That's an important point. In this study, they engaged in the web-based PREPARE version. They were not, say, watching the DVD at home or doing this as part of a group visit? Rebecca: Right. Yes. Other studies have looked at group medical visits and things. Alex: We've talked about who was studied, what the intervention was. Eric: Was there anything else besides them just getting the Prepare for Your Care? It sounds like it was in a researcher's office, but were you contacting the physician, letting them know the outcomes of the discussion? Eric: Was there same thing as the last one where really no physician involvement, unless that patient brought it to their physician? Rebecca: Right. The idea is that we would give these patients and the hope was that they would be activated to then go and bring this up and bring this stuff to their primary care appointment. After somebody reviewed either the easy-to-read advance directive or PREPARE in the advance directive, we gave people those things to take home and deal with what they wanted. We set up these interviews one to three weeks before primary care visit so that one to three days before the visit, our team called them to remind them about their visit. People on the PREPARE group were reminded, "Hey, you might want to bring this stuff up to your doctor." There was a reminder in there, but that's how that worked. Alex: Great. What did you find? Rebecca: Yes. Super exciting, I have to say. We found that virtually every single person in this study, 98% of people who were randomized to the PREPARE trial, increased their engagement in advance care planning. They did some increased form of advanced care planning, whether that was thinking about their wishes, talking, planning, or documenting. Rebecca: Another great question for everyone who might be watching this, because we actually have validated surveys that pick up advance care planning engagement. We've been, as a little aside, because these surveys can be used both in clinical and research opportunities, can actually pick up multiple behaviors in advance care planning and people's readiness to engage in those behaviors. This is awesome, but we basically have validated a four-item version that is able to pick up change. That's not the version we used in this trial, but we since have validated it. It's free actually and we're putting it up on the PREPARE website so anybody can use it, and we're finding that there actually might be clinical utility in using these four-item questions, because it can help hone down who's ready to do what. But we also know that it picks up change and response to an intervention. So it’s actually really good for research studies, but that's how we found where people were on their engagement level. Eric: Okay. 98% engaged compared to 97% in the ... Compared to what? Rebecca: I think it was ... Hang on one second. I think it was 89%, I think, with the ... Let me just make sure I'm not lying to you. It was, yes, 89% in the easy-to-read advance directive, which was also amazing. Alex: Which is pretty darn good. You can give them an easy to use advance directive and you get 89%. Close. We'll call it 90% of people to engage in advanced care planning to some degree. Rebecca: Exactly. That's super exciting to us, especially since, maybe you guys don't know, but we got funding from the Gordon and Betty Moore Foundation to update these easy-to-read advance directives in English and Spanish for all 50 states, and they're available for free on the PREPARE website. Eric: What else? Is there changes in documentation? Eric: But wait! There's more. Rebecca: Yes. There's more. For those people who need to check off that box about documentation, and there are quality metrics looking at this, so it's really important. There’s are some reimbursement to hospitals for this type of documentation. Its' really important. Again, with these patient-facing tools, we found that people in the PREPARE arm, 43% of them had new advance care planning documentation in the medical record over 15 months. Rebecca: The easy to read advance directive was 32%. For a behavior that's really hard to change, and when you look at how studies have done in the past, if you just hand somebody an advance directive and how do they do in primary care, you're looking ... Most studies showed between 5% and 20% for patient-facing. This actually more than doubled that. I think it also goes back to that thing that if you give people materials they can actually understand and aren't scary, they actually might be able to look at them and read them, fill them out and do something with them. Eric: Right. Take ownership too. The idea of this doesn't all have to take place in the physician or the social worker office, that this could be done at home, and that they play probably the most important role here in making these decisions. Eric: Was this working equally well in English speakers and Spanish speakers, or did you see any differences there? Rebecca: Yeah, I think that was the other thing that was really exciting to us, is that when we looked at interactions, which means splitting it out by language and health literacy and education, we found that PREPARE and easy-to-read advance directive worked equally well in English speakers and Spanish speakers and equally well in people with high-education and high health literacy and low-education and low health literacy. Alex: So, what is the difference between this study called PREPARE 2, for short, and PREPARE 1, and anything you found that is different or surprises you about these new findings? Rebecca: Yeah. I mean, I really thought that when you take something like the VA system, which is a little bit more of a universal healthcare system, maybe has some more supports and has some better, at least right now, documentation abilities that's changing at the county hospital. But when this study started, I thought for sure that the rates would be higher among veterans. And when we looked at the low health literacy rate in this population, overall it was 40%, and among Spanish speakers, it was 60%. Then when you look again historically at how hard it is to help these patients engaged in advance care planning, I actually thought our rates would be much lower, and they were actually higher. Alex: Huh! Is that because the follow-up time was longer? Rebecca: It could be I think for a couple of reasons. One, our follow-up time was a little bit longer, and I think, again, because advance care planning is a process, people can keep increasing overtime. That's one thing. The other thing is that we really spent a long time and really thoughtfully over many years creating these materials with and for these patients and their caregivers. We have stakeholder advisory groups that really helped us through every step of the way, and this was really created so that it was culturally appropriate, and I actually I hope that one of the reasons is that this really resonated with people. Eric: I got a bigger question. Just going through my mind, what is ... If you had to come up with the perfect primary outcome here, because it sounded like when I asked about documentation, you're like, "Oh, yeah. It's important from different quality measures, things like that." It sounded like you're really excited about engagement. When you think about, let's say, PREPARE 3.0 study, and if you had the design of a perfect primary outcome, what would it be? What are we hoping to achieve here with advance care planning and how do we measure it? Rebecca: Well, so it depends upon ... There's a lot to unpack there, Eric. Eric: Uh-oh! I was hoping for a one-sentence answer. Rebecca: I think the easy answer, and I will just tell you too that since I'm involved in ongoing studies about this, which we can talk about, we're using the four-item advance care planning engagement survey, because to me, again, as the clinician, and you guys are both palliative care clinicians as well, at the bedside, if people have engaged in any of these stuff beforehand, it's so helpful. To me, any increase in engagement, and by that I mean starting to think about their wishes or values, starting to talk to other people, that's really important to me and I think it's clinically meaningful even if you haven't signed your name on a piece of paper yet and completed an advance directive. To me, that's most important. I will tell you, and that's why I said it's a complicated question, because we actually completed a study, which Alex was a part of, where we actually asked experts to rate what they thought outcomes for advance care planning should be. Many of them are things that are picked up and are survey, like talking to surrogates and things like that and identifying their wishes and goals. Eric: Please don't say DNR. Please don't say DNR. Rebecca: DNR was way down the list. It was like advance directives actually was number 10 on this list. Number one was care consistent with goals, but that's like a whole other show, because that's hard to measure. Alex: It's hard to measure, but that is the holy grail of measurement here, because that's ultimately what we care about with advance care planning. Is, does it lead to people getting the type of care that matches their underlying goals. That's where we need to head eventually, but science is an incremental process. Eric: It makes me also think when we think about engagement, because I think that most challenging situations is have their loved ones been engaged in their advance care planning? Which it's great that people are engaged, but if they're actually not talking to anybody, it sounds like that's one of the questions. If the surrogate is not involved, maybe they're talking to their lawyer or their doctor, but their surrogate isn't involved. In the end, it doesn't really matter that much if nobody knows. It's like if a tree falls down and nobody is around. Rebecca: I mean, it's so interesting that you say that. The stats essentially say that 75% of us will need some surrogate decision making at some point in our lives. I think we know, all of us here, that it's incredibly stressful for surrogates. Studies have shown increased PTSD. These are the people that have to go on living being in this situation. I like to say that surrogates are often the part of the equation that is left out of advance care planning. I think that's to be honest, it's one of the things that we really baked into PREPARE, because when we were doing our focus groups, that's what we heard. Surrogates were saying these pieces of paper are nice, but we never had these conversations. No one talked to me. I don't know why they chose what they chose. I like to tell this story, and I think we've talked about this before, Eric, that you can go to an ICU family meeting and you could have somebody who completed their advance directive five years ago, but the family is still looking around at each other like a deer in headlights, because nobody had this conversation and they don't understand what the format or what were they thinking. Or you can have a family that's never had an advanced directive, but they could say, "I've been talking about this for the past five years, and this is really hard," but I really know what this person wants and what's important to them. Eric: One of the things that we're acknowledging as far as our team is ... How well are we proactively including family members in discussions early on not just when we need them, but actually before we need them to make decisions to lessen the burden on them and to make sure that we are making sure that care will be consistent with goals. Honestly, I think that is one of the big areas of improvement that we need to do, and I wonder from the same team from other palliative care team's perspectives. How proactive are we in engaging family members? Alex: You know where we're not doing a good job of? Preparing. Alex: If only. If only there was some way. Eric: I still feel like probably we are often reacting more than being proactive and preparing. Alex: Yeah, I agree. Yeah. Rebecca: One of the things too, just back to that, not just palliative care, but let's talk about geriatrics and primary care, which is some of the work that I do. Going back to that redefining the planning and advance care planning, for people who are listening to this, Terri and I actually wrote out, here are some steps you can do in primary care. We know you don't have a whole lot of time, but you can break it up. And one of the key pieces is it's not only, hey, do you have a surrogate? But what have you talked about with that surrogate and does this surrogate know that they were chosen? Rebecca: I can tell you that since I started doing that in my own clinic, I have more than a handful of people, when I've actually called up their surrogate to say, I'm sitting right here in clinic talking to your loved one and they said that you were the person they chose, they've said no. Better to find out now, like you said ... So you have time to prepare and plan. Find the person or support that person so they feel like they could actually do it. Alex: This is great. This is where the rubber meets the road. Do you use PREPARE in your own outpatient practice? Rebecca: I do. I actually do. I'll tell you, I don't think it's right for everyone. I do think, again, being a geriatrician, and not everybody has access to the internet and things like that or feels comfortable, but for those older adults who do, they've been really engaged, their tablet, their phone. They've shared it with all of their family members. I think where it's also been really helpful is that some of my patients will come in with their loved ones and they'll say, "I don't know how to start this conversation with my mother, or father, or aunt, or uncle, or husband. How do I do that?" I think what's nice about the videos is that part of the website, you can go through it and it's interactive, but there are also what I like to call the movie version of PREPARE, where you could just play all of step one like a movie, which is about surrogates, or all of step two, which is about defining your values and goals. I have found that to be really helpful. If people don't know how to start that conversation, they can always say, "Play step one," and watch it together and then have a conversation. The other thing I'll put in a plug for is that for free, on the PREPARE website, are PREPARE pamphlets, which I like to say are the Cliff Notes of PREPARE. I print those out and give those out, because even if somebody can't get to the website, it really gives you some words that they could say to start these conversations. Alex: This is great. Rebecca uses it in her clinic. Now we're going to go even one level deeper here. Go really deep here. Alex: Does your mom use PREPARE? Rebecca: Yes! Yes. I tell this story that the way that I got my mom to start doing advance care planning is I told her that I really needed help and input about PREPARE, and she was a great editor, let me tell you. But by doing that, it was really helpful, because we could start talking about it. Now,I mean, I think it's really ... It's been really helpful. I think that experience really helped her when she was helping my aunt, her sister, when her sister was dying, have these conversations and to be her advocate and talk to her clinician. My mom is such a great spokes model, but I think we were talking, I'd love to have her be the spokes model for PREPARE, but she is my mom, so she's a little biased. Eric: Okay. Let's say I have a primary care clinic, or a geriatrics clinics, or a palliative care clinic tomorrow and I'm going to give this a shot with one of my patients. Can you give me a couple of steps that I should do to do advance care planning with PREPARE? Rebecca: Yes. I think one of the things you can do is print out the easy-to-read advance directive and print out the PREPARE pamphlet. I think, again, if you go back to the redefining the planning and advance care planning paper, we often make this a lot harder on ourselves than we need to. You can start by asking people have they done advance care planning or completed advance directives before? If they look at you and they have no idea, then you know where you're going.But if they have, then you can have a conversation about, "Tell me what it said on those forms, and who have you talked to?" You can figure out what are the next steps that you need to do. Again, in outpatient, you don't have very much time. Eric: No. I'm looking at my watch right now. Rebecca: Yeah. Number one, ask them if they have a surrogate. Who they would choose? Ask them what they've talked to that person about or what they would talk to them about. Number two, you can ask them whether they've thought about what's important to them in their life and their medical care, and if they don't know, give them PREPARE pamphlet and send them to the PREPARE website. Eric: Great. Remind me, the end of the PREPARE website is an action plan that they bring back to me potentially? Rebecca: Yeah. The way that the website is set up, this is before we actually created the easy-to-read advance directives for all 50 states, you can create a summary of my wishes. Now that the advance directives are integrated right into the PREPARE website, people have a choice. Maybe you're not ready to complete the legal advance directive, but you're going to go through the website and have a summary of your wishes that can still be used as a template when you're having conversations with your family and friends and you could still bring that into your doctor. If people are ready to do the advanced directive, by the end of this year, we'll have the opportunity that's automatically pulled in to the easy-to-read advance directives. Eric: Wow! You're saying, if I work in Alabama and I have a Spanish speaking patient it will, potentially at the end of the year, auto-generate the easy-to-read advance directive? Eric: Then I bring that into my clinician's office? Eric: Holy smokes! We'll have to have you on for a third time. That is impressive. That is completely positive. Everything happens outside the physician's office or NPs office. Alex: That's the way to be. Rebecca: I think the other thing too for snowbirds, people who, say, are in New York in the summer and in Florida in the winter, if you go and you complete your advance directive and save, you can switch it over to the different state, because all 50 states have their own laws. There're 50 different types of forms. Alex: Oh! This is good.This is the future. Alex: I am just completely impressed by what you're doing. Again, looking forward to having you on a third time. Alex: Yes. Thank you so much, Rebecca. This was terrific. Rebecca: Thank you, guys. This is great. Eric: Where can we find the article again? Rebecca: It's in JAMA Internal Medicine and the website is prepareforyourcare.org. Eric: Wonderful. For anybody, we really encourage you to try it out in the next week or two when you have those patients and leave your comments on the GeriPal blog about how that have worked for you. Eric: With that, I think, Alex, do you have any other questions? Alex: No. I think we're good. Eric: How about you end us with a little bit more? Eric: I love it. I love it. I want to thank all of our listeners for joining us in this week's GeriPal podcast. Rebecca, thank you for joining us. For our listeners, we look forward to our next podcast next week. If you have a second, please rate us on your favorite podcast software, iTunes, Stitcher, or whichever one you use.